The Canon 100D SL1 is the go-anywhere camera, cramming SLR features inside the smallest and lightest camera body to date. Canon faces an interesting challenge these days. With the introduction of mirrorless cameras – ones that have all the SLR features in camera bodies the size of compacts – along with camera-equipped smartphones, the heyday of the DSLR seems to be coming to an end. While DSLRs still have superior image quality to tiny compact cameras their size and bulk prevent many people from carrying them around at all times. And – as you might already be aware – it's the camera you carry with you that captures key moments and preserves memories throughout your day. Professional photographers continue to use their SLRs when they need to maximize image quality, but even they are migrating over to the new breed of phones and cameras that fit into a jacket pocket. So what is a company like Canon – the leader in the SLR category for years – supposed to do about it? Perhaps the Canon 100D SL1 is the answer. The cameras that many will compare the Canon 100D SL1 to are mirrorless models like the Panasonic DMC-GH3 or the Olympus OM-D E-M5. For those not in the know, a mirrorless camera is virtually identical to a DSLR except that there is no system of mirrors inside to reflect the image from the lens up to a viewfinder. 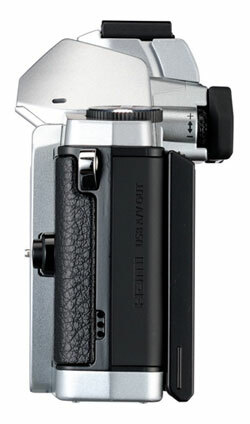 This means that many mirrorless cameras have no viewfinder at all – you have to compose photos using the rear LCD screen. If you want a viewfinder, it will be electronic: kind of like a miniature TV screen. By omitting the mirrors and viewfinder, camera makers are able to create camera bodies that are as thin and light as compact digital cameras but still let you change lenses (see the side view of the Olympus OM-D E-M5 to the right). These cameras are also called "interchangeable lens compact cameras" but I find that more long-winded than "mirrorless". 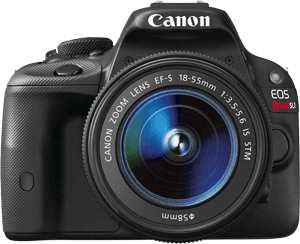 Now, the Canon 100D SL1 does have a mirror and viewfinder – making it a "true" digital SLR. But it's not nearly as large as its DSLR cousins. The easiest way to see how the size and weight of the 100D SL1 compares to other cameras is to find a camera store with a variety of different models and hold each one in your own hands. Since you probably have neither the time nor the inclination to run off to a camera store at this very moment, we'll try a different approach: the table below compares the size and weight of the 100D SL1 to other compact DSLRs and one mirrorless camera. A quick look at this table should indicate just how compact and light this camera is. While it's not nearly as narrow as the Olympus OM-D E-M6 (due to the mirrors inside) it's smaller - and definitely lighter - than all of these compact cameras. If preventing excessive wrist strain is important to you, then the 100D SL1 may be just the camera you need. 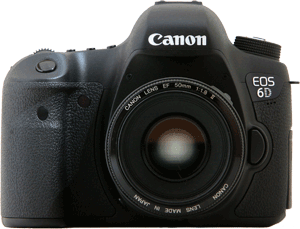 With the information about size pretty well covered, let's take a closer look at what else this Canon DSLR has to offer.